Thorny stems and leafy bands intersect on this dress, producing a trellis-like effect. They give the cotton a light and delicate appearance, which is heightened by the double neck frill and gathered sleeves. Similar garments are depicted in fashion plates of the time and in portraits by artists, particularly in the works of Jean-Auguste-Dominique Ingres (1780-1867). 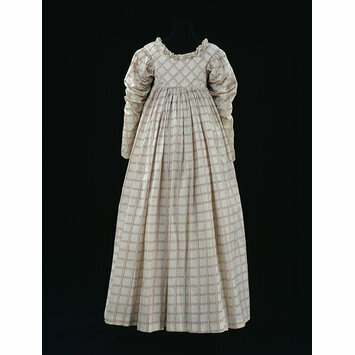 In his drawing Rosina Meli, Madame Guillon Lethière, and her daughter Letizia, Rosina's checked dress closely resembles the one in this example, except that she also wears a fashionable ruff. The back of the bodice has been shortened to correspond with the fashion for high waistlines. 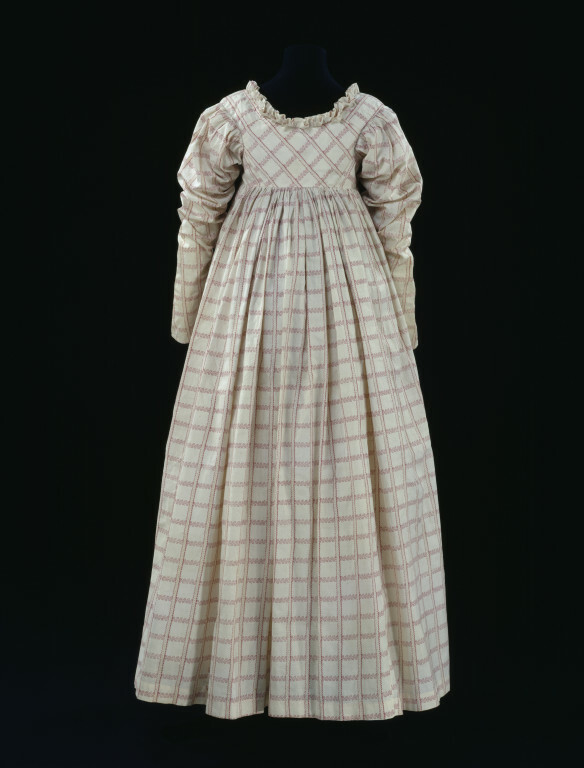 It may also indicate that this dress was worn during pregnancy, as garments were often adapted for this period in a woman's life. Contrary to popular myth, many women remained socially active right up to the time of their delivery. High-waisted dresses like this one provided comfortable and convenient maternity wear, which also concealed early physical changes. The drawstrings at the top and bottom of the front flaps may also have been inserted for pregnancy, to accomodate a growing bust size. Day dress of printed cotton with cotton bodice lining and under flaps.